Stuff at home tend to break, so having some basic handy tools to properly maintain your home is a must. Do you know which are the tools you need to get first? Here is the list of the most necessary ones. Trust me, this will be of great help to you when something has to be fixed ASAP. The first thing you should buy is a toolbox where to neatly put all of your tools. It’s definitely helpful to organize them in a proper manner because that will make using them a lot easier. And lastly, having them well-­organised just makes you want to put them to work. You must invest a lot in a good quality hammer because this is one of the most important tools you should acquire. Anti­-vibration rubber grip and a steel handle, ahh, a piece of art. Note to self: that hammer works miracles for demolition. And let’s face it, who doesn’t like breaking stuff? Screwdrivers fit small spaces and are also one of the essentials. That’s why you must get a good set. If you are doing mini DIY in your home late at night, they’d be the perfect tool for any type of job. And if you’re of the more practical people, you could go with a set of interchangeable bits for more flexibility. You can’t go without one metal case tape measure. It can be slimmer so you can fit it into your toolbox. Having a tape measure is absolutely necessary when you’re bringing new furniture in your home, or when you’re constructing new ones by yourself. So there you have it, that’s number 4 on our list. This is an important part of your toolbox set if you want to fix minor plumbing issues by yourself. For all other issues with the pipes, you can always count on the expert plumbers to assist you. Back to the adjustable wrench now, you’ll see for yourself that it’s quite convenient and as the name suggests, it fits all types of nuts and bolts, so don’t forget to buy one. If you’re after a home renovation project that involves rebuilding walls, you’re in need of a putty knife. It’s good for scraping off wallpaper and spreading spackle over small holes in the walls. It’s very useful because of its used quite a lot. It comes in handy for cutting all kinds of materials and things that would be too difficult for a pair of scissors. 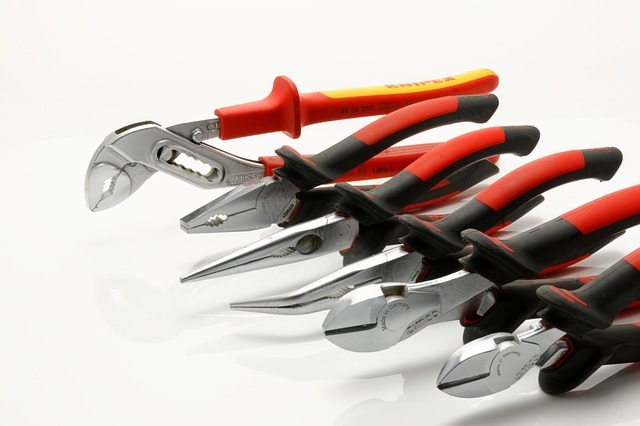 For any project where you have to cut, grind, or bend wire you’ll need pliers. From replacing the old shower head to straightening bent power­-cord plugs, pliers will definitely come in handy. And the power drill will help you with a number of repairs in your home. This is the most expensive instrument, but it’s worthwhile for any handyman tasks in the house, so invest wisely. And remember, an extra set of tools is always helpful, even if the profi handyman technicians are doing something in your house. Interesting: To view more resources about remodeling you can visit the website of National Association of Remodeling Industry. You can find many homeowners resources, so enjoy.